In March 2018 Invictus Yachts and Anna Fendi, designer, entrepreneur and co-founder of the eponymous fashion brand, announced a new partnership which will see Fendi design a special edition of one of the builder's top models. While the project is being kept under wraps until an official launch on March 23, with only the cryptic image above released so far, it is known that Christian Grande will take care of the exterior design while the interior decor will be by Anna Fendi and feature bold contrasting colours and bespoke furnishings inspired by vintage voyages at sea. To mark the 25th anniversary of BMW Individual, the bespoke arm of the famous German car marque, in 2017 the brand teamed up with Nautor's Swan to create the BMW Individual M760Li. 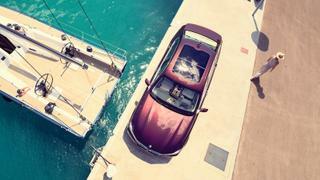 Based on the BMW M760Li xDrive V12 Excellence, the one-off model is inspired by Swan's classic sailing yachts with the Finnish builder even producing certain elements, including the car's teak boot floor panel, teak trims, entry sills and floor mats - by hand at its workshop in western Finland to ensure the M760Li has a true sense of yachting flair. The car's aesthetics are further enhanced by its damask red exterior and Merino leather interior in smoke white and Criolli brown, discreetly embossed with the Nautor's Swan logo throughout. On the technical side, a 6.6 litre V12 engine provides a sporty drive with an acceleration of 0-100 km/h in 3.7 seconds. Bonded by their shared Neapolitan heritage, Columbus Yachts - part of the Palumbo Group - and fine Italian tailor Cesare Attolini unveiled their partnership at the Monaco Yacht Show 2016. Finding common ground in their eponymous family names and their shared values of excellence, expertise and a wish to find custom solution to the problems of every client, the partnership saw Cesare Attolini dress Palumbo's Monaco Yacht Show representatives as well as display a range of nautically themed clothing on board 40 metre superyacht Divine. Just the first step in what the two companies hope will be a long and fruitful collaboration, expect many more exciting announcements to come. Another collaboration between a builder and a fashion brand is the perfect demonstration of the way the yachting and luxury industries are intertwined. Benetti joined forces with Italian tailoring brand Kiton in 2016 to offer customers a range of exclusive experiences during the Cannes, Monaco, Fort Lauderdale, Miami, Dubai, Singapore and Hong Kong yacht shows. Each brand's top clients were offered the opportunity to enjoy a private visit to the Kiton premises in Naples and the Benetti yard in Viareggio as well as access to Benetti's Yachtique styling lounges to become fully submerged in the superyacht experience. In October 2015 Dynamiq announced it would be working with high-end Italian fashion brand Trussardi on an exclusive interior design collection for the D4 series. The first yacht to benefit from this collaboration will be the 39 metre Jetsetter, the first hull in the D4 range, with options including chairs, sofas, carpets, fabrics, lights and décor for all open decks and guest areas. 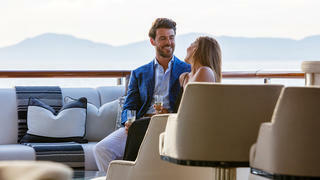 LVMH, one of the world's largest fashion and luxury conglomerates, acquired British builder Princess Yachts in 2008 and immediately put its high-end stamp on new releases. Those looking to buy the 30 or 35 metre versions of Princess' popular M class range can opt for interiors by Armani Casa or Fendi (pictured) and accessories from De Beers and Moet & Chandon, while owners of the 40 metre 40M class may also wish to buy the matching set of Louis Vuitton luggage. Working in partnership with luxury goods agency Agent de Luxe, Weyves Yacht has collaborated with not one but two high-end fashion designers. Created through the Wyves Couture Concept division, the first collaboration came in the form of an interior refit for the super fast Gentry Eagle with French couturier Thierry Mugler in 2008. A second, more ambitious project soon followed. Working alongside Dutch builder Oceanco and Lebanese fashion designer Elie Saab, Weyves unveiled the concept for the 117 metre Elie Saab ES117 yacht (Oceanco hull number DP095, pictured above) in 2010. The fashionable yacht concept has yet to be built – if it had been, Saab would have put his distinctive touch on both the exterior and interior design of the boat. 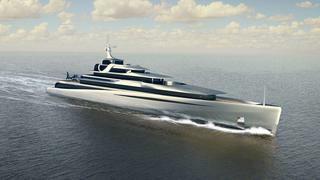 A helicopter, submarine, car and water toys all signed by the designer were also part of the superyacht package. Working in partnership with luxury goods agency Agent de Luxe, Weyves Yacht has collaborated with not one but two high-end fashion designers. Created through the Wyves Couture Concept division, the first collaboration came in the form of an interior refit for the super fast Gentry Eagle with French couturier Thierry Mugler in 2008. A second, more ambitious project soon followed. Working alongside Dutch builder Oceanco and Lebanese fashion designer Elie Saab, Weyves unveiled the concept for the 117 metre Elie Saab ES117 yacht (Oceanco hull number DP095, pictured above) in 2010. The fashionable yacht concept has yet to be built – if it had been, Saab would have put his distinctive touch on both the exterior and interior design of the boat. 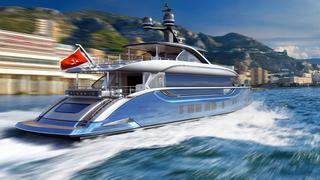 A helicopter, submarine, car and water toys all signed by the designer were also part of the superyacht package. When Monaco-based yacht maker Wally teamed up with French leather goods company Hermes, they went as a far as establishing their own business – WHY Wally-Hermes Yachts – to realise their vision of a new form of sea-based luxury lifestyle. The company’s initial concept stood somewhere between a private island and a superyacht with a length of 58 metres and a beam of 38 metres. Features included 900 square metres of photovoltaic panels for sustainable solar energy, a wide open-ended aft deck, Hermes interiors and furniture, a helipad and a spiral staircase leading to huge, airy living spaces. However, Hermes pulled out of the project in 2010 stating that it felt technically out of its depth and that it was best for the reins to be handed over to Wally. 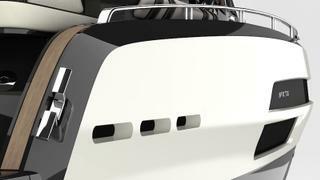 The yacht builder has yet to move the project past concept stage. When Monaco-based yacht maker Wally teamed up with French leather goods company Hermes, they went as a far as establishing their own business – WHY Wally-Hermes Yachts – to realise their vision of a new form of sea-based luxury lifestyle. The company’s initial concept stood somewhere between a private island and a superyacht with a length of 58 metres and a beam of 38 metres. 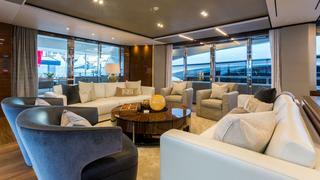 Features included 900 square metres of photovoltaic panels for sustainable solar energy, a wide open-ended aft deck, Hermes interiors and furniture, a helipad and a spiral staircase leading to huge, airy living spaces. However, Hermes pulled out of the project in 2010 stating that it felt technically out of its depth and that it was best for the reins to be handed over to Wally. 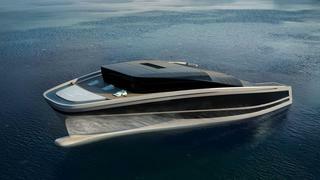 The yacht builder has yet to move the project past concept stage. 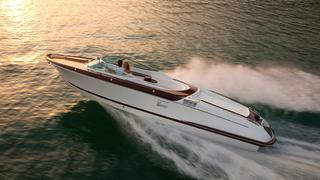 As part of Gucci’s 90th anniversary celebrations in 2011, the Italian fashion house teamed up with Riva Yachts to create the Aquariva by Gucci. All boats are made to order in a custom design by (now ex-) Gucci creative director Frida Giannini which includes a mahogany wood interior, the iconic Guccissima pattern on seats and sundeck and detailing in Gucci’s famous green and red signature shades. Giannini also designed a Riva apparel collection to match the yacht which included duffel bags, footwear and numerous nautical accessories.